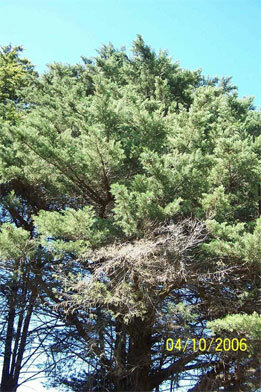 Cypress canker is a serious fungal disease that affects certain coniferous species. 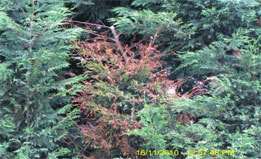 This pathogen interferes with the trees vascular system eventually causing stem, branch and eventual tree death. Drought and overly wet humid conditions will also exacerbate the situation. Seiridium canker is a weak pathogen belonging to mycological group Coelomycetes the disease caused by one of three species, S.cardinale, S. unicorne or S.cupressi. 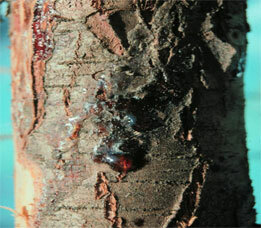 Fruiting bodies found on infected trees release airborne spores that disperse widely, transmission through physical injury caused by insects or birds creates entry points, and poor hygiene during trimming gives the pathogen direct vascular access. As the pathogen develops it girdles the phloem (bark) tissue, Initial Indicators are a loss of gloss and a dull appearance in new and established growth and this is followed by needle yellowing. 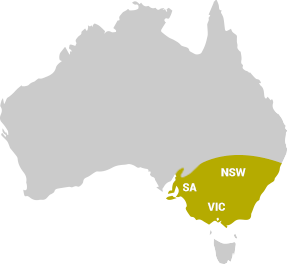 As the disease spreads inwards it attacks the cambial tissue producing symptoms like tip or branch dieback and stem lesions. 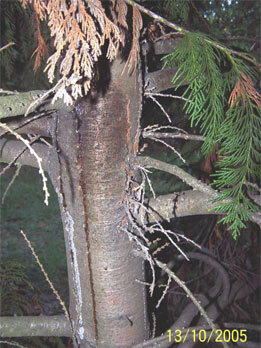 Trunks and branches typically have oozing resin and sunken areas of bark often have powdery brown deposits. 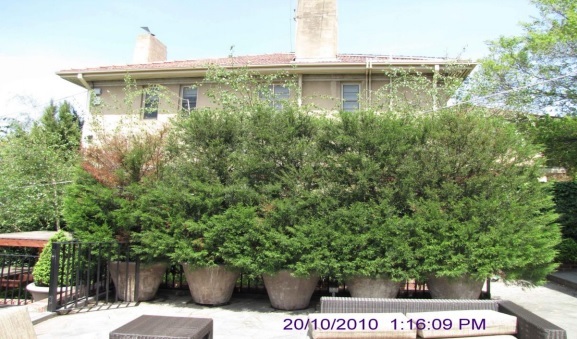 Typical early and advanced symptoms are often seen on the same tree, branch dieback and bleeding stem lesions are a response to the pathogen attacking the cambial tissue, this causes the eventual girdling or ringbarking of branches as seen in these images. 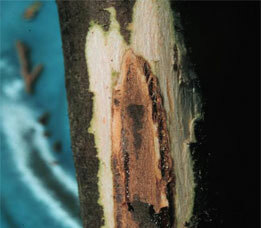 Bleeding resin on a stem lesion and the associated vascular discolouration beneath the bark of a stem lesion. 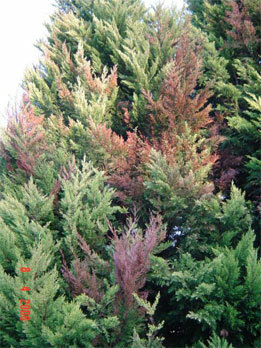 Early Symptoms of disease are discoloured patches that extend to cover larger areas killing whole sections. Treating this disease is no simple matter it is dependent on early diagnosis plus applying the correct chemistry; multiple applications are the focus in a successful treatment program. Methods focus on either stem injection or Airblast as the means of delivery; both have proven to be very successful in suppressing and curing this disorder. Successful control relies on using the correct chemistry ratio of solutes to penetrate the leaf and stem tissue. Active ingredients all have high systemicity within plant tissue, active components need to exhibit either phloem or xylem mobility. 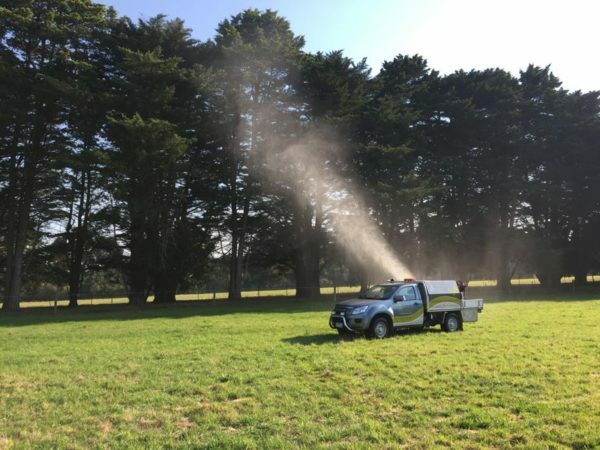 Air blasting: A one kilometer avenue of mature Monterey cypress, located at Woori Yallock Victoria. 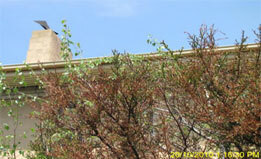 Our treatment program successfully arrested disease spread and restored tree health. 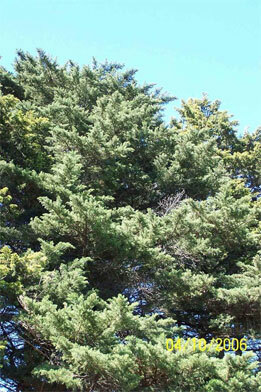 This treatment can treat trees up to 30 metres tall. Weather conditions apply. Two close up images of stem recovery in the same row of trees, first treatment was on February 1st 2006, dieback spread has ceased, new and healthy growth is evident. Treated again on October 4th & November 16th 2006, trees are still healthy and still free of disease on November 23rd 2010. 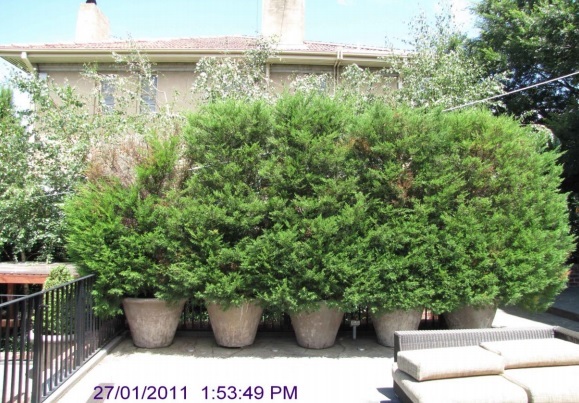 Document by Environmental Tree Technologies Pty Ltd 2011 No reproduction, use of extracts or images unless authorised in writing.